Caracas Chronicles: What's the UNSC vote really about? Is international peace and security advanced if you counter the power of the United States at every turn, or does it make more sense to work pragmatically with the hegemonic power, at least sometimes? Is US power a purely negative force in the world? Or is the US, at least on some matters, a benevolent hegemon, one able to work constructively towards international peace and security? These were the questions states were answering when they chose between Venezuela and Guatemala this week, and the answer has been clear: about 80 countries want a voice in the UN Security Council that will oppose the US on everything, always, and about 105 countries do not. Certainly that such a lot of countries stand ready to back a policy as radical as Chavez's gives a strong indication of how badly the Bush administration has damaged the US brand in world affairs. A bigger group of countries, though, feels less threatened by the US than by the forces the US is trying to contain. Which is why they prefer a functioning UN Security Council to one bogged down by rhetorical grandstanding by a rotating member. When you elevate "anti-imperialism" to the status of sole principle underpinning your foreign policy, you jump in bed, ipso facto, with forces far, far scarier than the US. How many UNSC votes did Venezuela lose to Chavez's flirting with North Korea? To his embrace of Ahmadinejad? To his solidarity with FARC? Certainly more than a few, probably more than he gained. When anti-imperialism is interpreted, Chavez-style, in the most primitive and unreflexive way possible - as an imperative to side with every enemy of Washington, all other considerations be damned - some governments may line up to applaud, but many more will write you off as an ideological zealot. Because it should be clear that it's Chavez's lack of sophistication, his utter tin-ear for the sense of the ridiculous that ultimately doomed Venezuela's bid. A loud and firm voice meant to balance US hegemonic power? Probably most countries in the world would love a country like that in the UN Security Council. But when you call George W. Bush the devil, a genocidal drunk, when you say he makes Hitler look like a suckling baby etc. etc. you cross that fateful border between the corageous and the ridiculous. Reducing diplomacy to the level of vaudeville act, you manage only to discredit the cause you claim to champion. 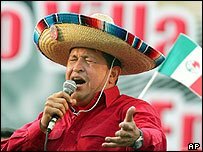 Ironically, by intensifying the link in international policy-makers' minds between "anti-US hegemony" and "comedically unhinged lunacy," Chavez has probably bolstered the legitimacy of US power more than he has undermined it. In a world where "only folks as nutty as Chavez" strike anti-imperialist postures, posing a strong challenge to American power makes you look like a nut. In the wake of Chavez's "devil" speech, the perception that Venezuelan foreign policy is just not serious has hardened. And that's an own-goal Chavez has scored all on his own, with no help at all from his myriad enemies, real or imagined.